The all new American Muscle Grill is a heavy-duty, no-nonsense BBQ that features the ability to burn literally five different fuels. You can do so all at once or separately—isn’t that the beauty of choice? “CHOOSE YOUR FUEL” is definitely an important thing to remember. Whatever your preference, wood, lump coal, charcoal, infra-red, propane or natural gas, this monster can do it all. 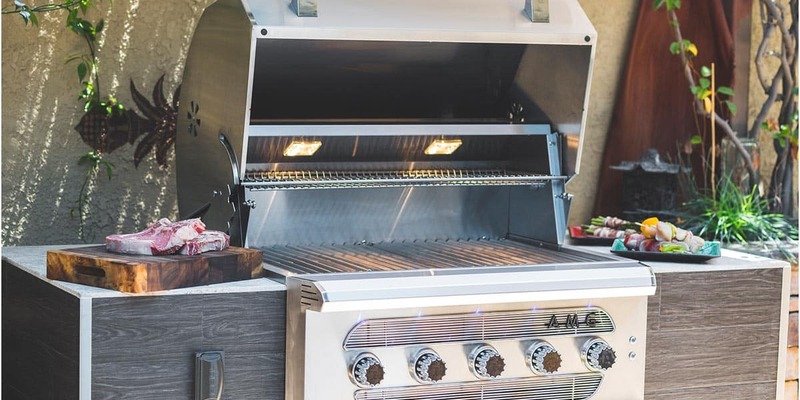 Designed, crafted, tested, and approved in the U.S., this grill is like no other. The 36-inch unit is stacked with 110,000 BTUs of raw horse power, and the 54-inch with a whopping 176,000 BTUs. That means your AMG is ready to cook on within minutes using gas or solid fuels. The AMG has the features and flexibility to be the last grill you will ever need. Barbeques Galore is proud to be one of a handful of authorized American Muscle Grill dealers in the United States. Come in to one of our stores or call your nearest location for availability and pricing information! Cooking Surface of 1,105 sq. in. LIMITED LIFETIME WARRANTY on hood, basin, front panel, grates, burner covers and fuel trays. UNLIMITED LIFETIME WARRANTY on stainless steel tube burners. LIMITED 2-­‐YEAR WARRANTY on valves, rotisserie motor, thermometer, and fixtures. LIMITED 1-­‐YEAR WARRANTY on all electrical (LED and halogen lighting). *LIMITED LIFETIME WARRANTY covers defects in manufacturer’s materials and workmanship. Warranty claims are valid for original purchaser with proof of purchase and photo documentation of defect. All warranties are subject to manufacturer review. *Warranty does not cover surface rust or oxidation as they can occur from harsh environments and corrosive chemicals. Warranty does not apply to commercial applications. Warranty does not cover damage resulting from improper installation, abuse, alterations, misuse, or improper care.